When 1996 news spread that a newly built Railway line was discovered in North-Western China that featured a scenic pass section with tunnels, viaducts that was reportedly entirely steam operated, it sounded amost unreal to me. The British news mag 'World Steam', until the global conquest of Internet the primary source of information on international Steam, wrote back then: "Just as you may have believed that everything is over in the world of steam and spectacular duties a thing of the past, news spreads of a newly built, entirely steam operated mainline with fantastic action in Northern China. Get your camera overhauled, take the offer for early retirement, postpone your marriage (or get divorced and kick your lover out) and get out to JinningNan - Tongliao!" I quickly made up my mind, told my boss that I need to extend my Christmas holidays (depite having no more credits), purchased a few dozen film rools and got an air-ticket to Beijing - all the rest I would find out in Inner Mongolia. 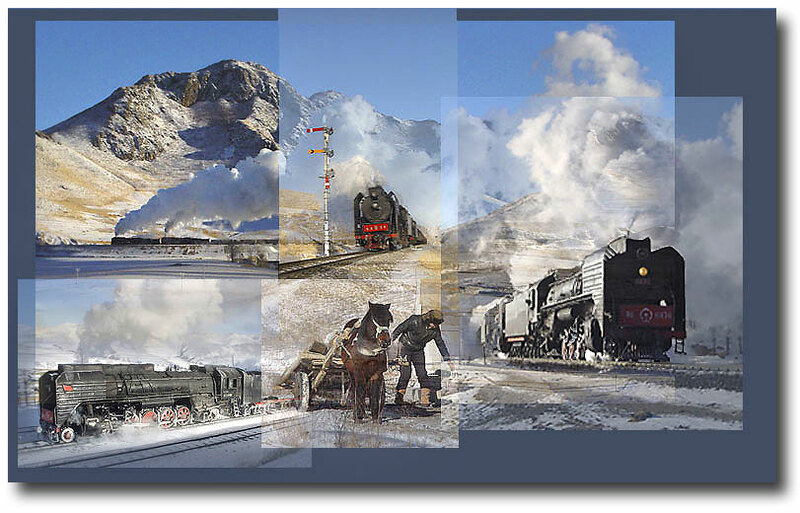 JiTong Railway and Jingpeng Pass during the Steam-era: Click on the images to get to the corresponding chapters! I dindn't expect too much. 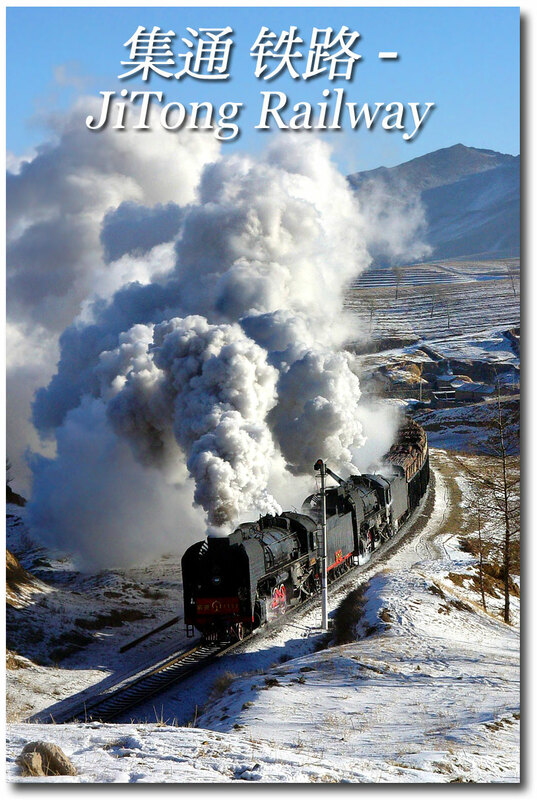 China's Ji-Tong - Railway and it's famous Jingpeng pass were simply the greatest show for steam on earth. While in China steam traction generally was on the retreat and new lines normally electrified or diesel operated right from beginning, the JiTong line was fully equipped with steam infrastructure such as water cranes, shed facilities and an engine workshop. And as to complement this, had most stations got semaphore signals - amazing in a country where virtually all railway lines had been equipped with daylight signals years ago. We learned that the construction was initiated and founded by Inner Mongolian Province Government and initial plans went back to the eighties. The line had to be built on a limited budget. And Steam was considered as the most cost efficient motive power. And while the Chinese Railway industry failed to meet country's growing need of modern diesels, surplus QJ - steam engines could be bought just for a part of the price from Chinese national railways - many of the 3000-HP-engines were less than 10 years old! The JiTong railway purchased no less than 100 steam engines and ovherhauled them. Traffic levels were at remarkable 5 Million tons for the first year, and had, by the year 2000, almost doubled. While the major part of the 900km from JiningNan to Tongliao leaded trough unspectacular Inner Mongolian plains and semi-desert with distant mountain ranges on and off, the scenery suddenly got mountinous after the small town of Jingpeng. This is where the line got spectacular, winding up in multiple horseshoe curves, tunnels and bowed viaducts, gently climbing towards a pass. Tractive efforts: Until 2005, this spectacular Ji-Tong line remained steam operated. Freights were hauled by the heavy 2-10-2 QJ (Quin-Jin, "Progress") class. While most trains required the combined force of two 2900HP QJ-engines, a single horse was just about enough to negotiate the steep path up to HaDaShan Station where a chart-load of coal was picked up. One of the most relevant websites for trainpics. US based, but with pictures from all over the world. You may search for JiTong, or China to get the respective collections. Comprehensive and up-to-date collection of information on Steam in China by Dave Fielding and Florian Menius. Trip reports in chronological order, steam lines, locomotive list and travel tips. Railography.co.uk Duncan Cotterill's Homepage Rail Worldwide. Features wonderful galleries as well as interesting and detailed trip reports go beyond the average. One of my all time favourites! RailwaysOfChina Interesting Website on Railways in China with many trip reports and pictures. Not only steam, but also modern traction. For a long time, organized steam-tours had the reputation of being overprized and getting poor results - merely the option for the consumer-type of enthusiast that preferred to travel in groups for avoiding all the adversities of organizing an own trip in foreign countries. The best opportunities such as early morning shots, tough, were often sacrificed for long breakfasts and organizational procedures, and all the great spots that normally required some hiking were off limits to tour folks. For such reasons, organized trips were out of the question to me right from the beginning in 1994, when I travelled first time to China. The German tour operator Farrail, tough, is a notable exception. Participants can benefit from the experience and know-how of the tour leader, and get opportunities often unavailable to the individual traveler. Have a look at the results from earlier trips and scheduled upcoming tours! 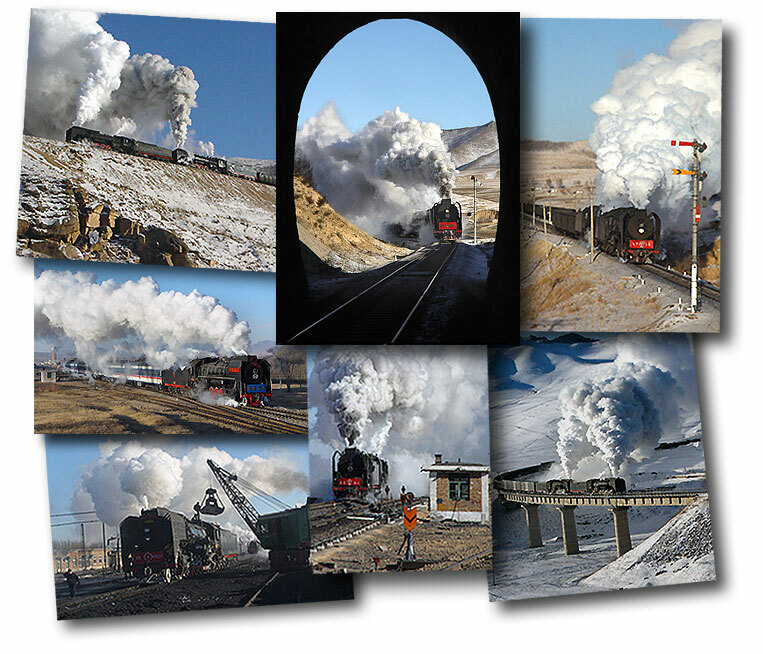 Eisenbahnromantikrat German Website with great pictures taken on varoious Farrail-Tours to Northern China. Trip reports and picture galleries about steam in China and worldwide from Ian Lawrence. Travel Photography Network features many interesting articles related to photography in General. highly recommended.